Ceramic vents formed in the shape of different types of birds that are used to assist with pie baking. Dating back centuries, the use of pie birds began in Europe as a means to allow the heat to be released from the pie as it baked to keep the juices from boiling out and over the pie crust. 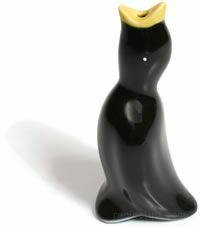 The small ceramic bird is hollow and shaped so the head is in a raised or upright position with an open mouth that serves as a funnel. When baking a pie, the bird is placed in the center of the pie shell so the pie filling can be laid around the bird. After the pie is filled, the top crust is then draped over the bird like a tent with the bird holding the center of the crust raised upward and the beak or mouth protruding outside of the crust. As the pie bakes, the steam is released through the funnel or mouth of the bird, so the filling does not overheat. Pie birds are available in the shape of various birds such as song birds, chickens, and ducks, but are also made in many other shapes, such as snowmen, Santas, and characters of people. In addition to the name pie bird, this baking utensil may be referred to as a pie vent, pie funnel or pie chimney.